AMMONNEWS - Prime Minister Omar Razzaz held talks with Italian President Sergio Mattarella on Thursday that focused on means to forge closer bilateral ties as well as the latest developments in the Middle East. During the talks, which were attended by a number of ministers and officials from both sides, the prime minister stressed the importance of improving bilateral cooperation and opening wider fields of cooperation between the two countries in number of fields. 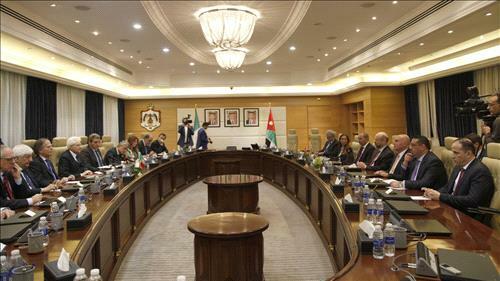 Razzaz welcomed the important visit of the Italian president to Jordan, stressing that it represents an opportunity to push forward the bilateral relations and the distinguished partnership between the two countries. "This is a great opportunity to discuss many issues of mutual interest," he said, affirming that the two countries share a vision of the future that focuses on strengthening their existing partnership. The prime minister also expressed Jordan's keenness to enhance coordination between the two countries on the situation in the Middle East, particularly promoting security and stability and supporting efforts to achieve peace to the region. He also pointed to fields of cooperation between the two countries and opportunities to boost it in the economic, trade, cultural and tourism and agricultural fields and the role that could be played by the private sector in enhancing relations. The Italian president expressed appreciation of the invitation extended to him by His Majesty King Abdullah II to visit Jordan and his admiration for His Majesty's vision of wisdom and balance in dealing with crises in the Middle East region, stressing that Jordan plays a key role in the region and the world. President Mattarella stressed that political and economic stability in Jordan encourages Italy to increase its cooperation with Jordan, pointing out Italy's desire to expand the fields of political, economic and agricultural cooperation. During the talks, Minister of Foreign Affairs and Expatriates Ayman Safadi and his Italian counterpart Enzo Moavero Milanesi presented a briefing on the meeting they held yesterday to implement the outcomes of His Majesty's talks with the Italian president as well as means of coordinating stance on bilateral, regional and international issues, mainly efforts to achieve peace in the Middle East. State Minister for Investment Affairs Muhannad Shihadeh also presented a briefing on prospects of joint cooperation, mainly with regard to investments, agriculture and tourism and possibilities for Italian companied to take part in reconstruction process in the region.